I tried learning to drive almost 2 years ago with a different instructor and hated the experience from the off set. I felt uncomfortable and was petrified. 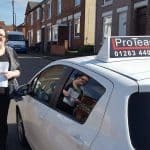 Browsing on Facebook I came across Proteach and spoken with Anne who said she would pass my details onto Darryl to try automatic lessons, and it was the best decision I have ever made. I remember my first lesson I was a dithering wreck, who was adamant I would never pass my test. With the support from Darryl after 37.5 hours worth of driving lessons I passed my test 1st time with two minors. I can honestly say without the support of Darryl and the belief from him that I could do it I would have given up. For anyone who is scared, adamant they will fail and a nervous wreck before giving up please try ProTeach and Darryl because if I can pass anyone can! Thank you again to Darryl and Proteach.